The ARRI T1 1000 Watt Location Fresnel Light is large, traditional fresnel light for indoor and outdoor use. It will provide a 2.8' diameter beam from 20' away at full spotlight mode. In flood mode it provides a 20.4' beam. 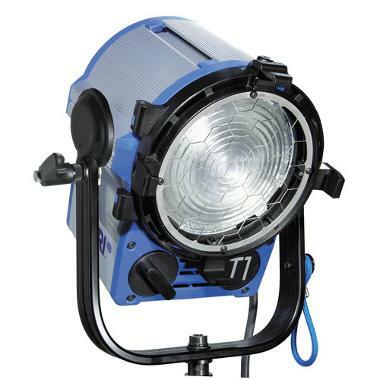 It is made of pressure die cast and extruded aluminum to withstand a rugged filmmaking environment but this light does need some protection against rain. A stainless steel friction disc locks down any large front-mounted accessories and it has a 5.91" fresnel lens inside a ribbed housing which allows this light to run a little cooler than older models of fresnel lights. The ARRI T1 features special air channels built into the aluminum for a constant stream of air passing through the lens and into the lamp regardless of angle. This light is ideal for large video and photo sets. • This light is set at 1 temperature, tungsten 3200K. To alter color or temp, you must use heat-resistant gels, which are not included. • A spare Impact EGT bulb is included with this rental. If you should have to use it, please also return the burnt out bulb with your rental. • To dim this light, you must also rent a 1000 Watt Rotary Dial Light Dimmer for ARRI Lights. • Dimensions: 14.1" x 12.7" x 8.5"